LDAP Synchronization, a.k.a. Cache Refresh, is the process of connecting one or more existing backend LDAP servers, like Microsoft Active Directory, with the Gluu Server's local LDAP server. Syncing people and attributes from a backend server speeds up authentication transactions. It is possible to perform attribute transformations, changing the name of attributes, or even using an interception script to change the values. Transformations are stored in the Gluu LDAP service. If you are syncing user information from multiple backend servers (AD or LDAP) simultaneously, the backend tree structure should be identical. - Part 1: What is 'Cache Refresh' and How Does it Work? Only sometimes it is the same LDAP server. To synchronize user accounts from an external LDAP directory server, you can use the built-in oxTrust features for Cache Refresh, which supports mapping identities from one or more source directory servers. Enable 'Keep External Person' during CR setup. This will allow your default user 'admin' to log into Gluu Server after initial Cache Refresh iteration. If you do not enable 'Keep External Person', your 'admin' user including all other test users will be gone after first Cache Refresh iteration. Make sure you are using LDAP authentication, not VDS. You will only need VDS setting if you are using the Radiant Logic Virtual Directory Server. Check the snapshots folder to see if files are being created. Use the oxTrust admin to browse users. Try to log in with one of these users. We assume that you have also setup your Gluu Server to use the correct LDAP server for authentication. The deployer needs to know various values of the backend AD to configure Cache Refresh. For example, host & port, bindDN user information, bindDN password, Objectclasses, attributes which will be pulled etc. In addition, the deployer needs to know generic information about the Gluu Server's LDAP. By default, the deployer can use localhost:1636, cn=directory manager, password chosen during installation, ou=people,o=site as server information, bindDN, bindDN password and baseDN respectively. After collecting this information, the deployer can move forward with the Cache Refresh setup. Last Run: The date and time of the latest cache refresh cycle completion is shown here. Updates at the Last Run: This shows the total number of users who have been updated in the last Cache Refresh cycle. For example an user who has any of his attribute updated will show up here. Problem at the Last Run: This shows the number of users who have been rejected by the Gluu Server during the update. If there are any rejections, please contact Gluu Support for clarification and help. Key Attribute: This is the unique key attribute of backend Active Directory/LDAP Server such as SAMAccountname for any Active Directory. Object Class: This contains the Object Classes of the backend Active Directory/LDAP which has permission to talk to Gluu Server Cache Refresh such as person, organizationalPerson, user etc. Source Attribute: This contains the list of attributes which will be pulled and read by the Gluu Server. Custom LDAP Filter: If there is any custom search required, this filtering mechanism can be used such as "sn=*" whereas the value of this field ensures that every user must contain an attribute named SN. 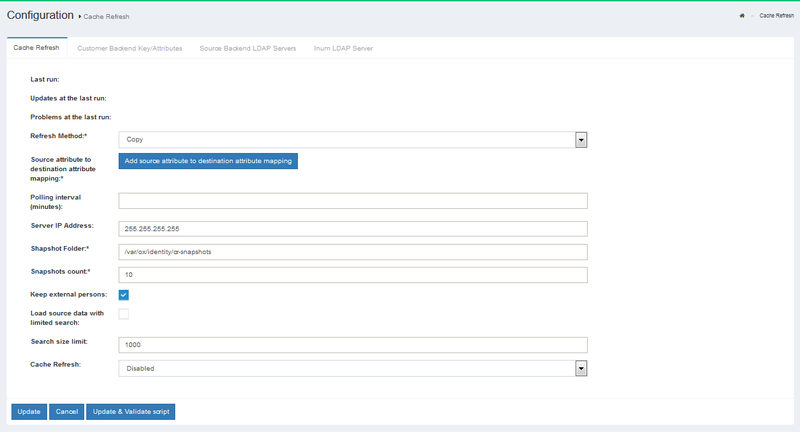 This section allows the Gluu Server to connect to the backend Active Directory/LDAP server of the organization. Name: Please input source as the value. Bind DN: This contains the username to connect to the backend server. You need to use full DN here. As for example, cn=gluu,dc=company,dc=org. Max Connections: This value defines the maximum number of connections that are allowed to read the backend Active Directory/LDAP server. It is recommended to keep the value of 2 or 3. Level: TBA Server: This contains the backend Active Directory/LDAP server hostname with port i.e. backend.organization.com:389. If organization has a failover server, click Add Server and add more hostnames with port. Base DN: This contains the location of the Active Directory/LDAP tree from where the Gluu Server shall read the user information. Enabled: This check-box is used to save and push the changes. Do not use this unless the server administrator has entered all the required values. Change Bind Password: This can be used for a new password or to change any existing password. Use SSL: Use this feature if the backend server allows SSL connectivity. If your organization has a multiple Active Directory/LDAP server, click on Add source LDAP server and add the additional server information. Please remember that a failover server is not a new server. 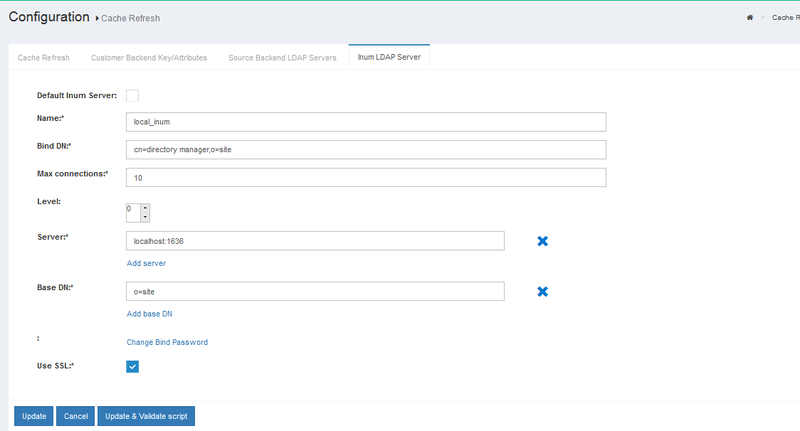 This section of the application allows the server administrator to connect to the internal LDAP of the Gluu Server. As Gluu Server administrator, you do not need to insert anything here in this section as new Gluu Server versions automatically populates this for you (unless you try to manually configure it anyway). Refresh Method: The Gluu Server allows the Server Administrator to apply two types of Cache Refresh mechanism--(i) VDS Method and (ii) Copy Method. VDS Method: Any organization with a database like mysql can use the VDS method. This option can be enabled via the drop-down menu in Refresh Method option. Copy Method: If the organization has any kind of Active Directory/LDAP server, they are strongly recommended to use the Copy Method from the drop-down menu. When the Copy method is selected, a section for Attribute mapping will be exposed. In this section, the Gluu Server Administrator can map any attribute from the backend Active Directory/LDAP to the LDAP cache of the Gluu Server. In the source attribute to destination attribute mapping field, you can enter the source attribute value on the left, and the destination attribute on the right. In other words, you can specify what the attribute is on the backend in the left field, and what it should be rendered as when it comes through the Gluu Server in the right field. The Administrator can select any Cache Refresh Method according to the backend Active Directory/LDAP server, but there are some essential values for both types of cache refresh method. The values are given below. Polling Interval (Minutes): This is the interval value for running the Cache Refresh mechanism in the Gluu Server. It is recommended to be kept higher than 15 minutes. Script File Name: The Gluu Server cache refresh can accept any kind of Jython Script which might help to calculate any custom/complex attribute i.e. eduPersonScopedAffiliation. For more information please contact Gluu Support. Snapshot Folder: Every cycle of Gluu Server Cache Refresh cycle saves an overall snapshot and problem-list record on a specified location. This is where the Gluu Server Administrator can specify the location. You can easily decide whether cache refresh synchronizes all users or not. Generally the rejected users are enclosed in the problem-list file. An overall report is displayed at the top of the cache refresh page with headings Updated at the last run and Problems at the last run. Snapshot Count: This defines the total number of snapshots that are allowed to be saved in the hard drive of the VM. It is recommended to be kept to 20 snapshots. The Gluu Server 3.x introduced two upgraded sections here. Server IP Address: Put the IP of the machine running oxTrust here. This ensures that the Cache Refresh mechanism runs perfectly in a clustered environment. Removed Script File Name location: New version of the Gluu Server allows the administrator to manage your custom scripts with more interactive section under configuration named Manage Custom Scripts. Update: This button is used to push the changes in the Gluu Server. Hit this button only when the values have been entered, completely. Update and Validate Script: This button is used to test the operation and integrity of any custom script such as a Jython Script. By default, Cache Refresh runs on the node specified in the Cache Refresh GUI in the IP address field. If CE or the external database is installed on a container such as Docker, that IP address could change, causing Cache Refresh to fail. To prevent this, a new method is now available in the Cache Refresh script, allowing administrators to add alternate startup logic to keep the process working as expected. print "Cache refresh. Is start process method"
When Cache Refresh runs, it'll first try to use the listed IPs to synchronize. If the IP check is successful, Cache Refresh will run. If it fails, it'll try again with the startup logic in the new method.